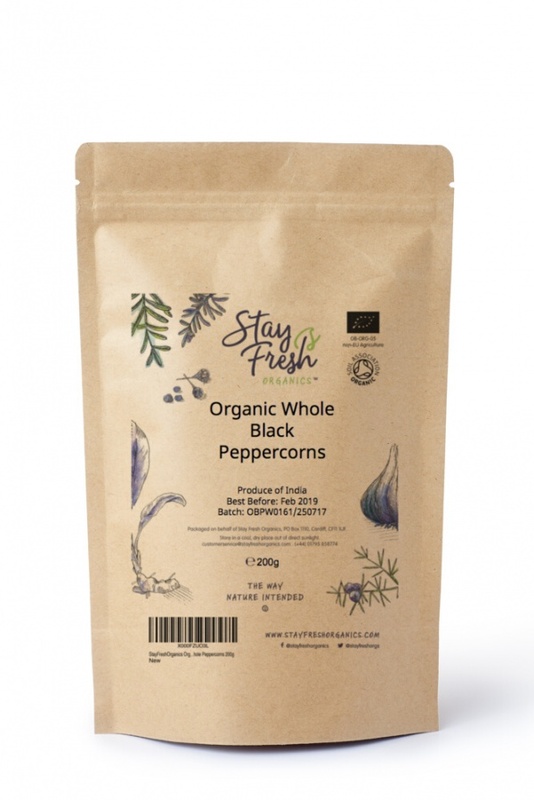 Stay Fresh Organics' organic black peppercorns are full-bodied with a strong aroma. They're fantastic for seasoning an array of global dishes and can be used in an infinite number of ways. They can also be used for their medicinal qualities and added to turmeric powder to make golden paste. Buy organic turmeric powder here. Black pepper is native to South Asia and Southeast Asia and has been used in Indian cooking since at least 2000 BCE. Peppercorns were a much-prized trade good, often referred to as "black gold", and used as a form of commodity money. A great product. Excellent quality and really helpful and knowledgeable team. Delivery superb. Would highly recommend and will purchase from stay fresh organics again. I have purchased the peppercorns to go with the Tumeric to make the Golden Paste, it's a great product, and good value.